Sometimes you just need a little backpack for traveling or being on the go. 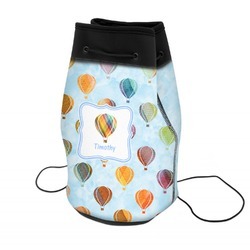 This neoprene backpack is the perfect thing for going to the amusement park or taking on a short trip. You can't go wrong with a drawstring backpack. This great little backpack is made from a double-backed neoprene, which will protect anything inside from warm temperatures on the outside. This makes it a great bag to use during the summer months! This bag measures at 12"W x 13"H x 8"D, so it is big enough to hold a good amount of stuff, but small enough to be a light bag to carry. The bag cinches closed at the top with the drawstring. There are several grommets around the top that the drawstring goes through in order for extra durability. The drawstrings are made of a small black cord. Go into our design center to get started creating your backpack. This is the opportunity to get creative! Pick exactly what you want to go on your bag from patterns to graphics. Even upload your own artwork and pictures! Ask us for help if you need anything at all. Now that you've found the perfect day bag, get a few things to go inside. Check out our section of Apparel and Accessories where you'll find keychains, ladies' wallets, men's wallets, and more. Go compare our different bag choices as well. In our Luggage and Bags section you will find several different choices like our backpack and messenger bag.